RVHS FFA Elected Officers 2017-18. 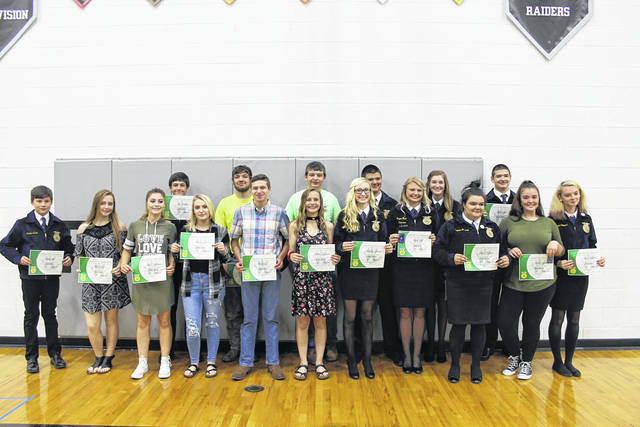 BIDWELL — On May 12, The River Valley FFA Chapter held their annual banquet. The banquet was called to order and conducted by the current officer team. The team includes President – Jenna Burke, Vice President – Kaylee Schultz, Secretary – Caleb McKnight, Treasurer – Allison Hale, Reporter – Skylar Jones, Sentinel – Jake Edwards, and Student Advisor – Josie Jones. The chapter welcomed guest speaker, Philip Eberly. Philip served as a 2017-2018 vice president at large for the Ohio State FFA. Greenhand Degrees were awarded to 45 freshmen members. Chapter Degrees were presented to 27 second-year members. 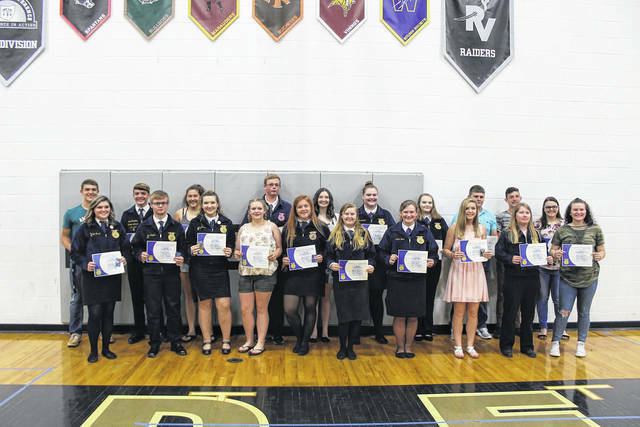 Eight members were also recognized for receiving their State FFA Degrees. Kaylee Lambert and Mikayla Pope were awarded their American FFA Degrees in the fall and received special recognition for their hard work. FFA Advisor, Matthew Huck, also presented several special awards for the year’s achievements. Special award winners included Outstanding Freshman – Cody Black, Outstanding Sophomore – Joel Brumfield, Outstanding Junior – Caleb McKnight, Outstanding Senior – Allison Hale. Honorary Member was awarded to Hannah Burke for her service to the chapter over the past four years. Freshmen Taylor Huck was chosen for the Star Greenhand Award. Jenna Burke and Kaylee Schultz split honors as the Star Chapter Award winners. River Valley FFA Alumni President, Stanley Bowman, presented three senior members with scholarships. The scholarship winners were Jenna Burke, Kaylee Schultz, and Ashleigh McGuire. New officers were also installed for the upcoming year. 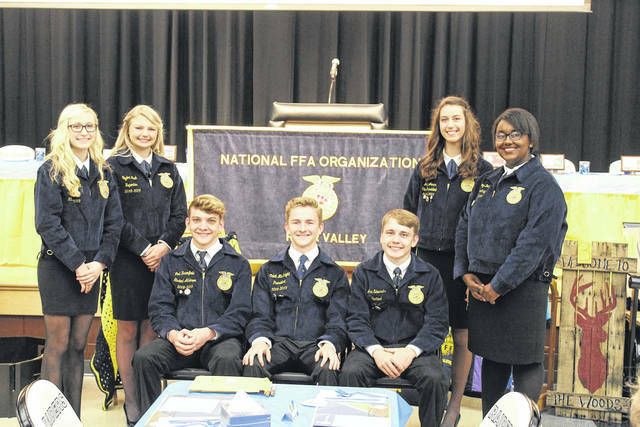 The 2018-2019 FFA officers are President – Caleb McKnight, Vice President – Josie Jones, Secretary – Destiny Dotson, Treasurer – Kennedey Lambert, Reporter – Taylor Huck, Sentinel – Jake Edwards, and Student Advisor – Joel Brumfield. RVHS FFA thanked those who continually support chapter and help provide agricultural opportunities for members.